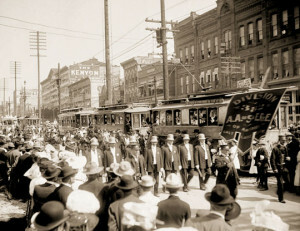 When members of The Church of Jesus Christ of Latter-day Saints first arrived in Salt Lake City, they began organizing the city by ward squares or blocks. Trolley Square is in a historic area of Salt Lake City that Brigham Young in 1847 designated as the 10th Ward when he was gridding the city into neighborhoods. 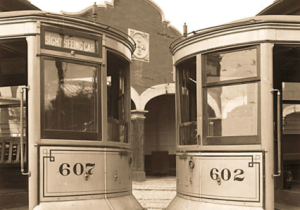 The Tenth Ward later served as territorial and state fairgrounds until 1908, when Union Pacific magnate E. H. Harriman chose the site for his state-of-the-art trolley car system. 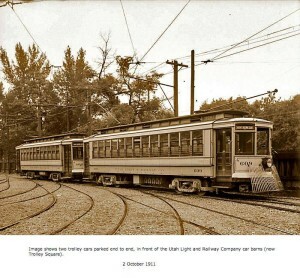 Salt Lake City was one of the first cities in the US to introduce a Trolley Car system, electrifying its first line in 1889. Harriman invested $3.5 million dollars into this site constructing the unusual mission-style car barn complex during 1908–1910. The largest building was used as a berth for the Trolleys. The middle building served as the machine or “rip” shop and blacksmith shop. The north building was a paint and carpenter shop. The smaller east building was the sand house. The water tower was designed to hold 50,000 gallons of water in case of fire. 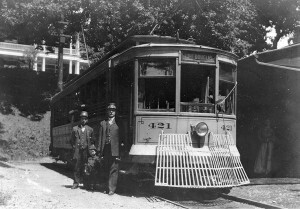 By 1914, more than 144 trolleys served the valley. The trolley car system ran through “Salt Lake City to Holladay, Sugar House, Bountiful and Centerville, totaling 146 miles of track,” and making it the premier transportation system in the state. The railway venture operated out of this location until 1945, after which Salt Lake City buses were housed here until 1970. Once the Utah Light & Railway Co. ceased operation in the early 1950s, the buildings were painted yellow and turned into bus storage. Eventually, the property fell into disrepair and was threatened with demolition in 1969. The car barns were saved from demolition in 1972 when a local family purchased the property, adapting it for retail use (“Trolley”). Wally Wright was the architect for the project—still well known today for his work on the historic property. Wright’s vision for Trolley Square was inspired by Ghirardelli Square—the San Francisco chocolate factory refinished as a shopping center. 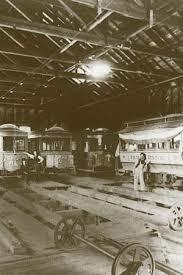 It was Wright’s idea to remodel and restore the trolley barns into Utah’s first festival marketplace. The first store to open at Trolley Square was the Trolley Gas Station (Razavi). The Old Spaghetti Factory, The Pub, and Payne Anthony—still open today at Trolley Square—were some of the other original businesses. Additional early restaurants and retailers include: Chalk Garden, Wm. B. Woods, Haroon’s, The Ice Cream Store, Corn Dog Trolley, Trolley Games, The Grainary Pizza Loft, Casa Del Sol, La Bathtique, and Trolley Theatres. Trolley Square quickly became one of Utah’s most popular attractions—offering unique shopping, dining, and entertainment in a charming, historic atmosphere. Trolley Square was registered as a historic site by the state of Utah in 1973, and it was added to the National Register of Historic Places in 1996. 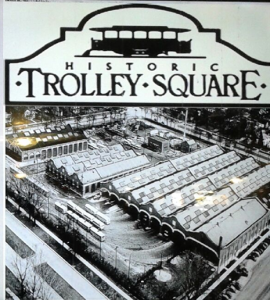 In May 2013, Trolley Square was purchased by Salt Lake City local Khosrow Semnani of S.K. Hart Properties. Semnani is working hard to return the historic center to its former glory. Since Semnani took ownership, Trolley Square has already begun various renovations to maximize the center’s potential—updating its original structure, receiving new landscaping, and revitalizing the historic water tower with new LED lighting. Additionally, a new Visitors’ Center is currently under construction—a space for visitors to learn about the charming history of both Trolley Square and Salt Lake City. New businesses continue to come in under Semnani’s leadership—including the well known high-tech giant GOOGLE, Cosset Bath and Body, Orangetheory Fitness, Trolley Square Barbers, CorePower Yoga, and The Falls—a 15,000-square-foot events center. An icon to Salt Lake City, Trolley Square has been both a cultural and retail anchor for decades. Just as legendary Wally Wright worked to transform the Trolley barns into a community gathering center, Khosrow Semnani has a vision to restore Trolley Square to the community-focused retail marketplace it once was. In his latest move to remake historic Trolley Square, owner Khosrow Semnani wants to build a new housing and commercial complex just south of the shopping center. 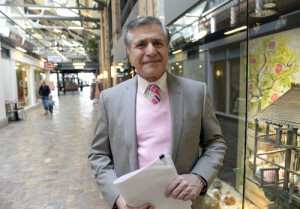 The Iranian-born industrialist, who bought the eastern Salt Lake City mall out of bankruptcy in 2013, has applied to rezone seven adjacent parcels, including the parking lot beneath the 600 South sky bridge. 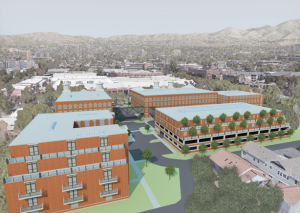 Semnani’s Trolley Square Ventures hopes to redevelop the land into a multistory, mixed-use complex of apartments, town homes and boutique retailers — with a major nod to Utah history. Designs are modeled on what was known as the Utah Exposition Building, a structure built on the site in 1888 and used in several state fairs. Preliminary renderings show several vintage buildings at least four stories high with a grand arched entrance facing 600 South and two dome towers. The exact number and mix of rentals hasn’t been decided, although Semnani said he would prefer apartments with larger floor plans. Trolley Square Ventures has made its initial application to rezone 3.75 acres for a blend of commercial and residential uses. Current designs call for preserving 288 existing parking stalls at the bridge’s base and essentially wrapping the new development around them. A Planning Commission hearing on the rezoning request is set for Wednesday. 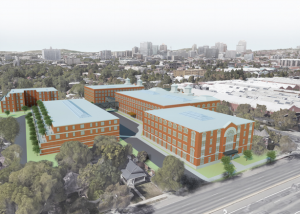 Because the site falls within the Central City Historic District, any new construction also requires review and approval by the city’s Historic Landmark Commission. Semnani hopes the project will attract singles, families and retirees to complement the mall by giving residents walking access to Trolley’s stores, restaurants and lifestyle amenities, including the Whole Foods Market grocery store, Orangetheory Fitness center and a soon-to-be-added day care. 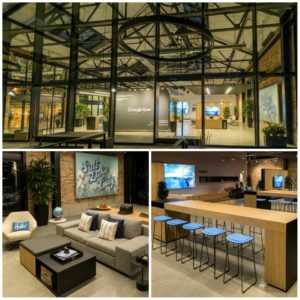 Semnani said the period architectural themes are part of a wider strategy of emphasizing the nostalgic nature of Trolley Square, known for its red-brick trolley barns, iconic water tower, wrought-iron balconies and other antique elements. Mall managers also plan to open an interactive kid-friendly museum, highlighting the site’s past as a former streetcar hub. “I really can’t wait to make all this happen,” Semnani said. A self-made millionaire and founder of a low-level radioactive waste repository in Tooele County that became EnergySolutions, Semnani was new to the mall business when he bought Trolley Square and adjacent land. After years of sales declines and a 2007 mass shooting, the shopping center was barely half full when Semnani’s S.K. Hart Management took over. Improvements to the exterior, tenant spaces and the distinctive water tower began almost immediately. 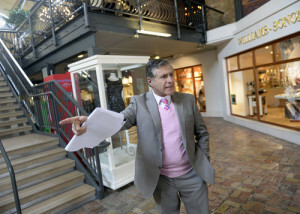 The businessman plans to spend up to $4 million on renovations. The shopping center is now about a third vacant, according to Trolley Square property manager Mandy McKenna. Mall managers have recruited key tenants, including an art gallery, coffee shop, fitness and yoga centers, a Gentlemen’s Barbershop, wedding clothier and a sizable events center available for private and corporate functions. Several longtime tenants said foot traffic has been improving.